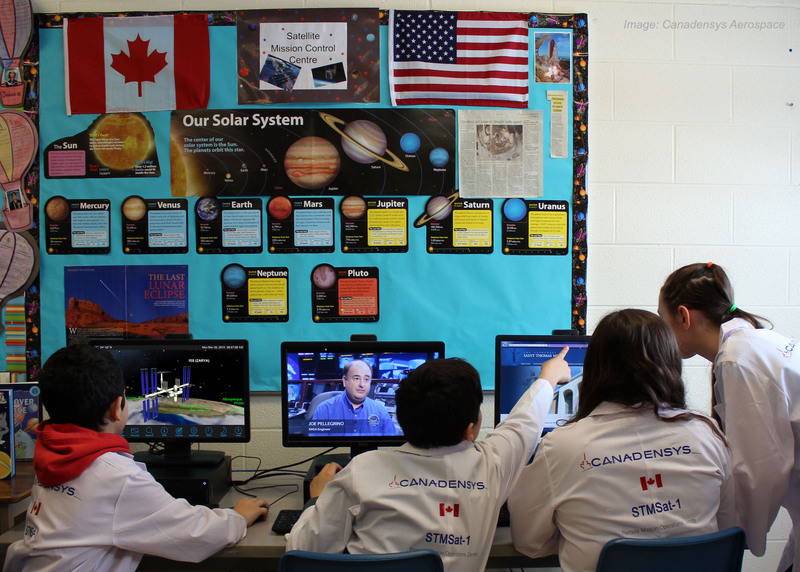 Satellite Centre at Canadian Elementary School welcomes visit from Member of Parliament and Canadian Astronaut | Canadensys Aerospace Corp.
TORONTO, ON / 07 APRIL 2016 – St. John Paul II School in Caledon, Ontario hosted a visit on Thursday 7th April 2016 by Ruby Sahota, Member of Parliament for Brampton North, and Canadian Astronaut Lieutenant-Colonel Jeremy Hansen for an inspection tour of their Satellite Remote Mission Operations Centre (RMOC) in Caledon, Ontario. Mrs. Sahota and Astronaut Hansen were given an inspection tour of their RMOC by the students themselves, and Astronaut Hansen addressed 700 students and teachers at the school about spaceflight and his own experiences in the Canadian astronaut corps. Canadensys Aerospace is providing the RMOC hardware and support to the students and teachers as technical advisor for the project in Canada. Students will use the RMOC to receive images taken and transmitted by the STMSAT-1 satellite as it orbits the earth. The satellite, built by US partner school St. Thomas More Cathedral School in Arlington, Virginia, will fly in an orbit 300km above the Earth, take pictures every 30 seconds and transmit them via radio waves back to the ground. The satellite is the first ever in the world to be built and designed entirely by grade school students, supported by technical advisors from NASA. STMSat-1 launched from the Kennedy Space Center in Florida on 6 December 2015 on an Atlas V rocket as part of a resupply mission to the International Space Station (ISS). Officials and student representatives from both schools, as well as technical advisors from Canadensys Aerospace and NASA, observed the launch of the satellite, which carried onboard the engraved signatures of every student from both of the schools. The satellite is currently on the International Space Station, where it will be deployed next month into its final orbit from a port in the Japanese module of the ISS. Once the satellite is in its final orbit, Canadian students from ages 4 to 14 will have the opportunity to experience real-life space mission operations from tracking the satellite as it passes overhead and receiving the transmitted images, to archiving them and interpreting the data received. A key goal of STMSat-1 is the early engagement of school children in science, technology and mathematics. The project is part of Canadensys Aerospace Corporation’s commitment to Accessible Space, providing broadened participation options in space missions across public and education sectors, and leveraging the unique potential of space to inspire and engage. Canadensys Aerospace Corporation (Canadensys) is a space systems and services company based in Toronto, Ontario with a focus on accessible space. The company is founded on heritage and expertise from three decades of international flight programs, combined with modern commercial approaches to space program and mission development. For further information visit www.canadensys.com or email: stmsat_rmoc@canadensys.com. For further information on the STMSat-1 mission and spacecraft please visit www.stmsat-1.org. St. John Paul II School is a K-8 Catholic elementary school located in Bolton, Ontario. It has an enrolment of 711 students. St. John Paul II is part of the Dufferin-Peel Catholic District School Board, one of the largest and most diverse school boards in Ontario with approximately 83,000 students in 149 schools located throughout Mississauga, Brampton, Caledon, and Orangeville. For more information about the Dufferin-Peel Catholic District School Board and St. John Paul II Catholic Elementary School, visit Dufferin-Peel online at www.dpcdsb.org. 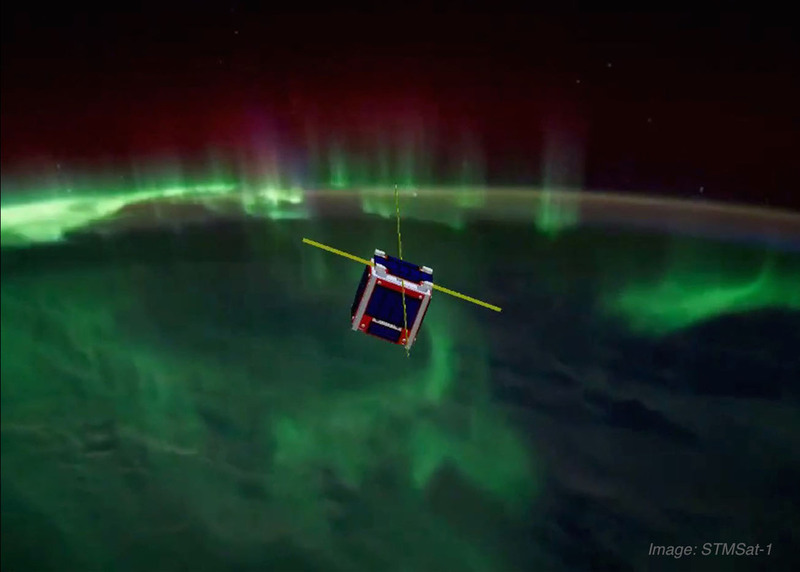 Elementary school-built STMSat-1, due for deployment from ISS in Q2 2016, shown in orbit passing over the Northern Lights. St John Paul II School students practice tracking STMSat-1 and downloading images ahead of deployment from ISS.